As a software architect, I usually “work with” technologies by drawing Boxes and Lines so I like to play with some of the more interesting stuff when I’m out of the office. Recently, I’ve worked a lot with Amazon Web Services (AWS) and Docker, having solved my initial teething problems with Docker for Windows, and I’ve decided to try something more adventurous. I run several WordPress based web sites, including this one, but recently they seem to be running slower and slower. That’s all the excuse I need to try to run them as Docker images on AWS using the Amazon EC2 Container Service (Amazon ECS). A quick Google shows that everyone and their dog has a blog post on this, but none of them were quite what I wanted. So, I’ve been experimenting, one step at a time. In this article I’ll setup a WordPress site using Docker and Docker Compose that lets me develop WordPress plugins and themes as well as creating content. If you’re following this, I’ll assume you have a reasonably up to date version of Docker installed on your computer. I use Docker for Windows, so there may be some small differences if you are using a Linux or Mac machine. mysql (https://hub.docker.com/_/mysql/) – a MySQL database server. This command downloads the latest mysql image from Docker Hub and runs it as a demon (-d). The root password is set using the MYSQL_ROOT_PASSWORD environment variable (-e). It will listen for connections on the default MySQL port, 3306. You can see each layer of the mysql Docker image being pulled from Docker Hub to the local cache – though some have already been retrieved for other images (probably a common base Linux image). The docker commands appear to borrow some common Unix command names. As you can see, I now have a MySQL server running in a Docker container (randomly named happy_booth) exposing the standard port 3306 for database connections, and with a root password of ‘rootpwd’. The WordPress image runs Apache HTTPD (serving HTTP on port 80) and PHP with WordPress files under /var/www/html. The MySQL root password is passed in with an environment variable and WordPress expects to talk to a host named mysql so I’ve linked (--link) the happy_booth to it. I’ve also mapped port 80 to 8080 so that I can view the WordPress site without clashing to IIS on my laptop. Navigating to http://localhost:8080 shows the start of the famous 5 minute install. Also, when I first tried this, I had omitted the password from the wordpress command and spent ages working out why it worked anyway. But when I restarted the computer and tried again – it didn’t work. I think an environment variable was still set by a previous run causing this problem. Before we move on, we have a few Docker Containers running in the background – and associated data volumes. It’s time to clean up. You could also have restarted the containers when they were stopped (using the docker start ... command) and the data will still be there in the volumes (if you haven’t removed them). Before I move on, these docker commands will get more and more complex – so lets switch to Docker Compose to simplify it all. 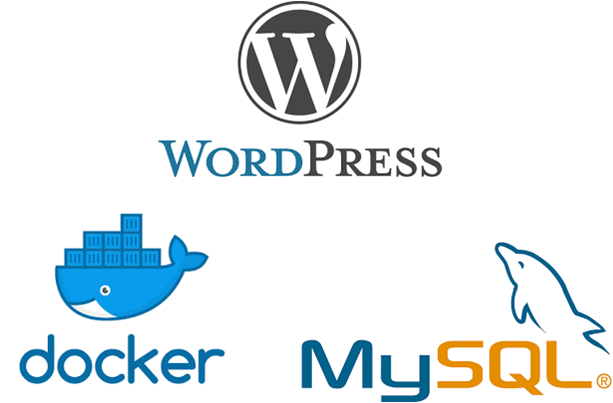 # Docker Compose file to run WordPress + MySQL in 2 docker containers. The docker-compose file syntax is described at https://docs.docker.com/compose/compose-file/. You can also remove any volumes (if you need) using the -v option. However, if you are building up a site’s content, it will be stored in those volumes, so you might want to hold off deleting them till you’ve done a backup of some sort (see later articles). That’s the basics done. In my next article (link here when I’ve written it) I’ll walk through externalising the WordPress installation and adding another developer feature.